Back in the old days of the 1980’s, the only treatment available was argon laser photocoagulation using the same thermal laser used to treat patients with retinal tears and diabetic retinopathy. The Macular Photocoagulation Study Group reported reasonable outcomes in the treatment of patients with choroidal neovascular membranes (CNV) not involving the fovea (the critical part of the retina which has the highest sensitivity). Unfortunately, if the fovea was treated, the vision deteriorated immediately, which didn’t best please most patients even though their vision in 2 years time was better than that observed in patients who hadn’t had the treatment. In the late 1990’s, photodynamic therapy (PDT) with verteporfin was introduced, which showed some benefit in treating patients with CNV under the fovea, provided the lesion was classic. In the early years of this century, treatment with anti-vascular endothelial growth factor (anti-VEGF) has been introduced, which have shown favourable results in all subtypes of macular degeneration, including occult disease. We found that with PDT, vision continues to deteriorate after treatment, albeit at a slower rate. With the anti-VEGF treatments, visual deteioration is halted in about 93% of patients and actually improves in about 30%. 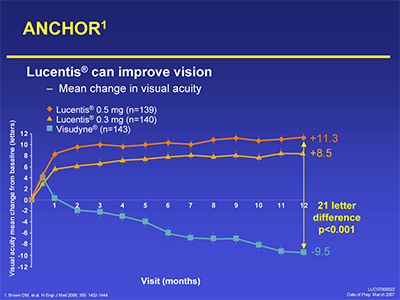 This is a slide from Novartis which is the drug company that distributes Lucentis, showing the results of landmark study labelled the Anchor study. This compared Lucentis to PDT in patients with classic CNV and clearly shows the benefit of the newer agent (Lucentis).